We finally have a trailer for Big Little Lies season 2! HBO released a one-minute long teaser clip last night. All our favourite characters are back, including a huge new addition to the cast. 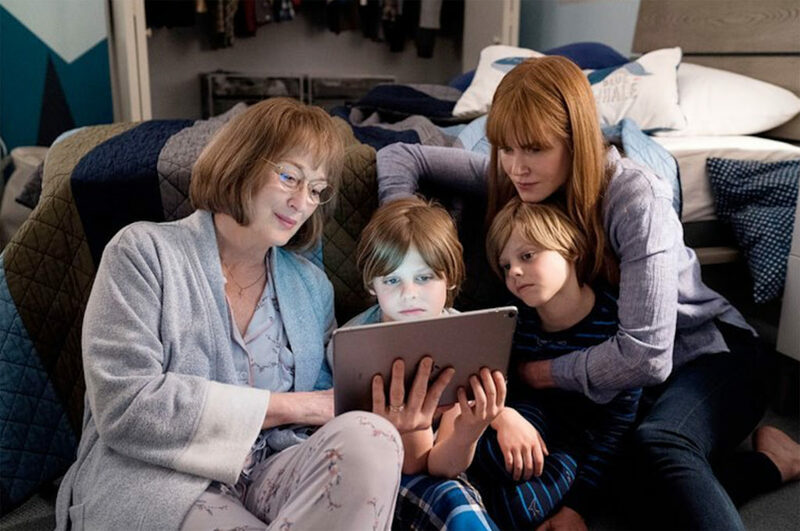 Meryl Streep plays Mary Louise, mother of murdered Perry Wright (Alexander Skarsgard). She has come to town to solve the death of her son and is very suspicious of the five lead characters: Jane (Shailene Woodley), Celeste (Nicole Kidman), Madeline (Reese Witherspoon), Renata (Laura Dern) and Bonnie (Zoe Kravitz). In the trailer Meryl is seen speaking to Madeline. She says, "My son is dead. I want to know what happened that night. I'm very tempted to ask you, but I don't think I would get the truth. Would I?" It seems that getting away with Perry's murder will make up the main story line for season 2. Jane, Celeste, Madeline, Renata and Bonnie are seen visibly shaken and paranoid throughout the teaser. In the first line of dialogue Celeste says to the others, "We're kidding ourselves if we think people will stop talking." However, we will see sub plots woven in across the seven episodes. It looks like romance is in store for Jane, and Madeline appears to be hooking up with someone who isn't her husband. The drama returns to HBO on June 9th. In the meantime you can read everything you need to know about Big Little Lies season 2 here.